THD is thrilled to announce the arrival of their new Flexi-50 amplifier head. The Flexi-50 is a precision hand-built 50-watt Class-AB amplifier with foot-switchable overdrive/boost, foot-switchable master volume control and the ability to use almost any preamp and power tubes in any combination, including 6L6, EL34, 6V6, 6CA7, 8417, 6550, KT66, KT77, KT88, KT90, KT100, EL84 (with Yellow Jacket adaptor), 6K6, 6F6, 12AX7, 12AY7, 12AU7, 12AT7, 12AZ7, 12DW7, 12BH7, ECC83, ECC82, ECC81 and many more, giving the user a huge palette of available sounds simply by changing tubes. The amplifier has a fat, clear, full clean sound reminiscent of late 1950s to early 1960s American combos, and overdrive to rival the best British heads. Even at the highest overdrive settings, the amp still demonstrates dramatic touch sensitivity, cleaning up very well when the volume on the guitar is reduced. Additional features include external bias test points and individual bias controls, permitting the user to quickly and accurately set the output tube bias with any digital voltmeter. The dual bias controls permit the user to correctly bias even mismatched tubes, eliminating the need for matched power tubes. What does all of this mean for you, the player? It could very well mean that the search for your sound is finally over. While our UniValve and BiValve-30 amplifiers offer the same flexibility and choice of tubes, they do so in a Class-A circuit. While Class-A amplifiers do have a strong following due to their smooth, even character, there are many players who need, or even crave the immediacy, clarity and "punch" of a grid-biased Class-AB amplifier. The 40 year-long love affair that guitarists have had with the now almost cliché 50 watt rock and roll amplifier head is proof of this. In the Flexi-50, we at THD have brought together an ideal combination of simplicity and flexibility, hence the name "Flexi-50". Why strive for simplicity? Robust design and construction are among the reasons. Ease of use is another prime reason. We hear every day from guitarists who have purchased 3- and 4-channel guitar amplifiers, only to discover that aside from varying gain levels, the channels all sound, (and equally importantly,) feel more or less the same, dashing their dreams of flexibility to pieces. Another byproduct of an overly-complex amplifier is that it can take a very long time to uncover a sound that really works for you. How is the Flexi-50 different? First off, it is a single-channel amplifier, but one that can be switched and blended among a number of different sounding and different feeling voices. The changes can come from a number of methods including foot-switching a preset boost level with its own, dedicated tone control that allows you to make your boosted sound darker than the clean sound, brighter, or anywhere in between. The unique combination of our touch-sensitive input circuit and the wonderfully active and reactive tone control section (that we slaved for a year to perfect) make for a front-end that really responds to subtle and not-so-subtle changes in the signal being fed into the amplifier either by the guitar or any effect that may be between the guitar and the amplifier. Back off on the volume control and the amp gets much cleaner without losing the fatness of the full-volume sound. How do we do this? You buy the sushi and we'll get as technical as you want, but what really matters is that it works, not so much how it works. Switch from an over-wound bridge pickup to a clearer, lower-output neck pickup and suddenly the amplifier responds very differently. Our input is quite sensitive to the individual impedance curves and inductance characteristics of your pickups, so you will not experience the all-too-common situation where every guitar you own sounds the same through your amplifier. PAFs sound like PAFs. Strats sound like Strats. Filtertrons sound like Filtertrons. Lipstick pickups sound like, well, like nothing else on the planet. Into exotic handmade guitars and pickups? Wouldn't it be nice to have an amplifier that lets you hear the diff erence between 9000 turns and 9200 turns of wire in a pickup? Come plug in and see (and hear) for yourself. You say that you like to use pedals? There are many talented pedal makers coming out of the woodwork from all corners of the world. The THD Flexi-50 has no trouble helping you hear the difference between a NOS military-grade germanium transistor and a modern "equivalent". You decide if they are equivalent or not, and with the Flexi-50, you will have the tool to do so. Does it like pedals? It LOVES them. More about the overdrive capability of the Flexi- 50... With its modified-design, custom-tuned post-phase-inverter master volume circuit, the Flexi-50 can give you a luscious palette of overdrive sounds before you even get the output stage working, and these sounds are all highly touch-sensitive as well. Switching tubes is easier than ever before. With the built-in bias adjustments, you can easily and accurately set the bias in about 20 seconds, even with two completely different tubes. Other features include a line-level effects loop and a 50-watt/20-watt switch right on the front panel, letting you drop the plate voltage on the power tubes from 475 to 325, giving not only lower output, but also smoother, more even response and even longer tube life. We also have a series/parallel switched impedance selector that can take any cabinet from 2 ohms to 16 ohms impedance, and always uses 100% of the transformer windings all of the time, another THD innovation. This assures you a full, even output sound, regardless of the impedance setting. The power and output transformers are fully shielded to assure that hum and noise are kept to an absolute minimum, and that pickup-feedback from transformer coupling is all but eliminated. But dont take our word for it. 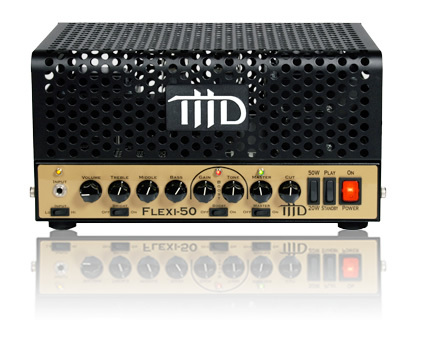 Visit your local THD dealer and find out for yourself why the new THD Flexi- 50 will have you selling your other amps. You just wont need them any more.